The Client Brothers – Interview | The Ark of Music – The best music in the world…you never knew existed. 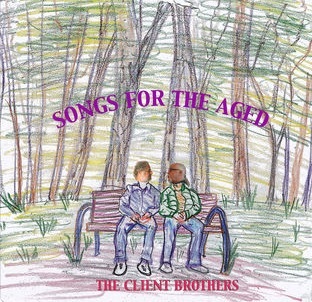 Below, you can read our interview with The Client Brothers, and listen to their album, Songs for the Aged. Check out our full music review of Songs for the Aged, HERE. Q: Okay, first off, who are you guys? Are you really brothers, or is that just the band’s name? We need names and band roles, please! A: The Clients (Joel & Robert) are siblings of Jewish/Polish heritage who began their musical careers in Minneapolis, MN during “The Summer of Love”. Joel, the older, began as a keyboard player in folk & psychedelic bands. Robert began as a bass player, and eventually expanded to guitars & keyboards. Both were highly interested in electronic music and were eager to embrace the digital revolution, first using MIDI control of synthesizers, and then to DAW & virtual-instrument technology. Joel does most of the drum-programming and keyboard arrangements. Robert adds guitars, bass, & vocals, usually. Although these roles are rather fluid. Both write the basic tunes, either individually or together. Q: Your musical history together includes 40 years and 6 total albums! Good lord! How did it all start? Who or what was the impetus? A: The Clients had been working in folk, rock, blues, & jazz bands independently for quite a while. We were at Toby Tune’s commercial studio in Minneapolis (Toby’s Tunes! ), when the urge to record together brought the brothers closer together, in a musical sense. (Mom was NOT impressed.) In order to garner more parental approval, attempts were made to actually make some MONEY at this! Contracts were signed with Toby’s record company, and our first record was released in 1981. “The Call of the Mall”/”Success” is a rare 45rpm disc released on “Aesop’s Label”, and a pioneering work of “Caucasian Suburban Rap”! Later came opportunities to record soundtracks for commercial spots, including local banks and Target Stores, as well as soundtracks for industrial videos and film. When Toby released one of the first sound effects libraries recorded in stereo, he added an LP of music that included many Client Brothers’ tracks. Q: You got your start doing soundtracks and commercial spots, and have since evolved into a multi-genre outfit which has created rock, jazz, hip-hop, new-age, electronica, and even comedy and spoken word! Explain yourselves! What drives this madness of yours which refuses to be boxed in by genre lines! A: Ours is work of passion. We passionately disagree about almost everything, and need music to make things better! Because Mom is rather “thrifty” with her approval, we decided we needed to at least APPEAR to like one another, and our mutual musical career seemed to satisfy that familial requirement. Beginning with simple 4-track analog recordings, a couple cheap keyboards & guitars/basses, we eventually found our way to analog monophonic synthesis, programmable drums & rhythm machines, polyphonic synthesizers, 8 & 16 track analog recorders, digital workstations and eventually virtual digital instruments. One of Roberts favorite things is to emulate electronic music on traditional acoustic instruments. Joel’s influences go all the way back to classic doo-wop. Since “The Client’s ALWAYS Right”, we figured we’d simply do just what WE want. Q: It seems you’re acquainted with one of our favorite indie-artists, Toby Tune. How do you know each other? A: Toby ran an amazing recording studio in Minneapolis in the later part of the 20th century, and runs his own record label! (He’s still one of our FAVORITE people.) Since he moved to Costa Rica we have visited him many times, and still love recording with him! Q: Your new album, Songs For The Aged, was recorded in Dominical, Costa Rica; Tucson, Arizona; and Minneapolis, MN. How did you manage such a well traveled recording schedule? How long did the album take to complete? A: We both travel a lot. With homes in both Arizona and Minnesota it’s possible to be in more than one city when we record. Thankfully that old inter-web makes it easier for us to still collaborate & get things done. As for Songs for the Aged, some of the tracks are relatively new—within a year—others we don’t actually remember recording! Q: Rumor has it you guys have never performed live!?!? How come?!?! A: While both of us truly enjoy playing to a live (er…PAYING!) audience, the kinds of layered sounds and multi-tracked voices we use don’t lend themselves easily to live performance. And we’re too cheap to hire a bunch of other musicians. Rather than hump an entire studio to clubs, or do “track-shows” (ewwwww! ), we decided to follow the Beatles’ lead and simply stay in the studio. We also, at times, smell kinda bad. A: Explosions are very scary. We’d rather not go there. Having already played with sidemen from Minnesota’s MOST famous artists—guys who played with Dylan & Prince—we’ve pretty much seen it all. A: Bernard Hermann (RIP)…or Phillip Glass. A: Robert: Journey to the Center of the Earth soundtrack by Bernard Hermann (except for the lame pop-vocals). A: Both Joel & Robert began playing music with piano & trumpet lessons! A: HI to the fellas in Square Roots (MN), and Lone Strangers (Costa Rica)! A: There are actually re-releases of some of our older work on albums (Vinyl) by Cut Chemist (USA) and Macadam Mambo (Paris) among others.